Batu Caves happen to be a popular and iconic attraction in Selangor. This is basically the site of Hindu shrine and temple that is dedicated towards Lord Murugan. It is being said that the limestone forming the caves are nearly four hundred millions years old. The most notable feature is Lord Murugan’s statue that stands at 42.7 meters. Some other cave temples include Temple Cave and Art Gallery Cave where visitors can find Hindu statues and paintings. Thousands of Hindus flock to Batu Caves during the Thaipusam festival and non-Hindus also come to the place to enjoy the unique festival and capture some amazing snaps. 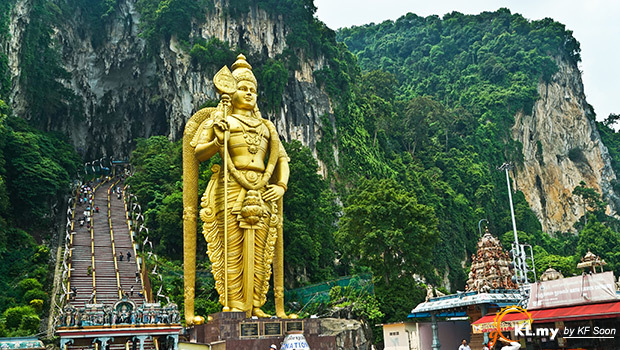 Batu Caves is famous for its Gigantic Lord Murugan Statue, which is the highest statue of Hindu deity in Malaysia. The statue stands tall to a lofty height of 140 feet at the base of the caves. There are two prayer pavilions in Batu Caves. One is located at a base while the other is inside the cave. The shrines show intricately detailed sculptures of Hindu gods on the roof. There are 272 steps leading to the cave. The mountain climbing enthusiasts can also try the rock climbing routes which are as many as one hundred and seventy in number. Sometimes, you’ll find a number of monkeys that are in the habit of freaking out the visitors. The caves have been formed naturally of huge rocks. The rocks have a rugged surface which aid in climbing. The roofs have sharp and pointed projections jutting down from the top. The interiors of the cave show intricate wall murals. The murals are dramatically painted by the artists and portray rustic settings as background for the Hindu deities. 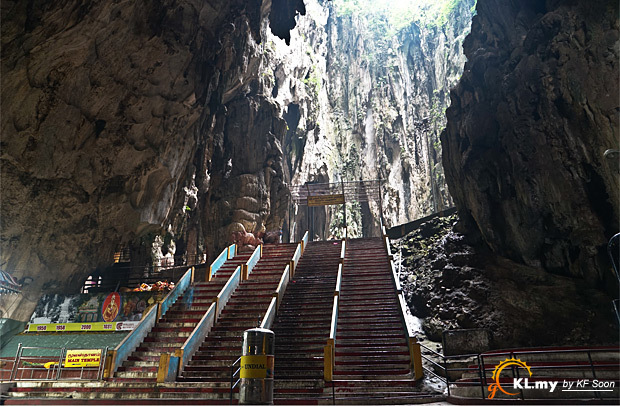 Ascending to the top of the Batu Caves would offer a panoramic view of the surroundings. The cave affords an amazing view of the entire township located miles away.